Welcome to Trains In The Valley! TrainsInTheValley.org is the website of Trains In The Valley, a grassroots community organization whose purpose is to advocate for improved and expanded passenger and freight rail service in the Pioneer Valley region of western Massachusetts. Springfield to Boston Train Service, Are We on Track? A new schedule for the Hartford Line went into effect this past Sunday, April 14th, 2019. The most notable change was the elimination of the one CTRail weekday train that arrived in Springfield from stations to the south before 9 am. New England Public Radio (NEPR) reported said that the train was dropped due to low ridership, which is not surprising considering that the train was scheduled to arrive in Springfield at the unfriendly time of 6.07 am. Unfortunately the new schedule provides no way for anyone who lives in Connecticut to commute to Springfield on the train for a 9–5 job. Amazingly, the schedule has four trains south (from Springfield) and no trains north (to Springfield) before 9 am. The Connecticut Department of Transportation (CTDOT) says that the problem is the single track between Windsor and Enfield. We also suspect that CTDOT desire is to focus their CTrail train sets on the New Haven–Hartford corridor since MassDOT at the moment only provides financial support for the Amtrak operated trains on the line. We don’t doubt that this statement is true, but one only has to walk through the Springfield Parking Authority’s garages on a weekday to see the many cars with Connecticut plates to figure out that -yes- there is demand for northbound service that arrives into Springfield before 9 am. Record ridership out of Northampton on the Vermonter. The panoramic image above shows the scene at the station in Northampton on Friday, March 8, 2019 — the last day of classes before the start of Spring recess at UMass Amherst and Smith College. How many people are in this line you might ask? We counted about 150. Just how long was the train stopped? A total of 10 minutes¹. 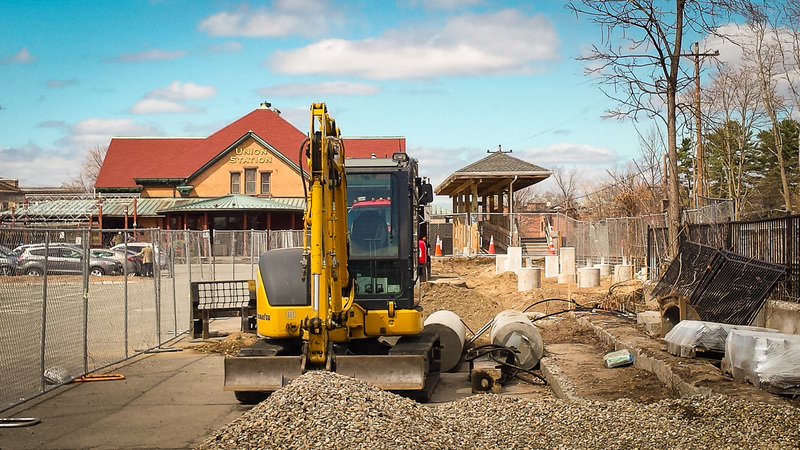 The project underway to extend the station platforms in both Greenfield and Northampton continues to move forward. The progress photos below show that most of the precast concrete foundations are now in place. If all goes well this project will be substantially complete by early July. If you are riding Amtrak’s Vermonter to or from western Mass between now and July 31, 2019 please take the on-line ridership survey that is now underway. Over the coming weeks surveyors will be meeting selected trains to distribute survey cards (shown above) to the arriving and departing passengers at each station. The results of the survey will be used during the development of the marketing plan for the new Greenfield-New Haven rail service. 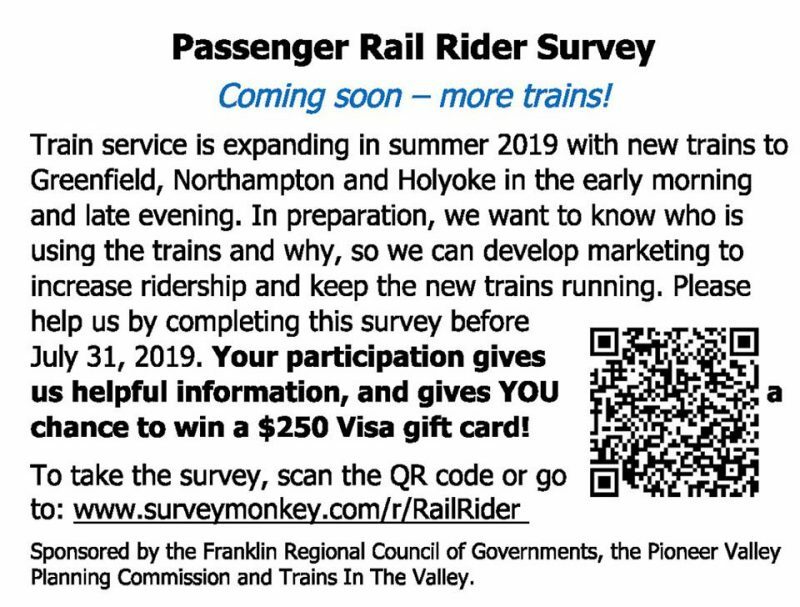 Note that this ridership survey is sponsored by the Franklin County Regional Council of Governments, the Pioneer Valley Planning Commission and Trains In The Valley. 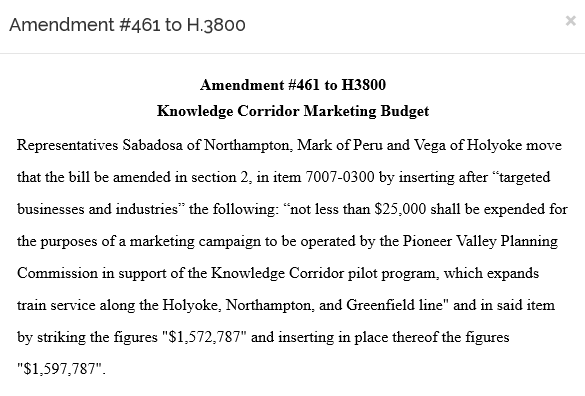 Representatives Lindsay Sabadosa (D-1st Hampshire), Paul Mark (D-2nd Berkshire), and Aaron Vega (D-5th Hampden) have filed an amendment to the Massachusetts state budget bill requesting that a sum of $25,000 be provided to support a marketing campaign for the new Greenfield–New Haven passenger rail service. The funds were requested as Amendment #461 to the Fiscal Year 2020¹ state budget bill. We remain hopeful that these funds will be approved when the state budget is finalized in a few months. ¹ The state fiscal year runs from July 1st to June 30th. 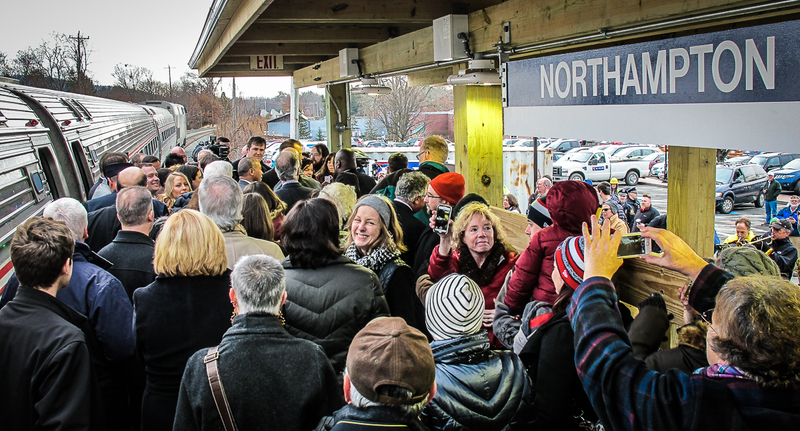 It was a standing room only crowd at the first public meeting for the East-West Passenger Rail Study in Springfield back on March 12, 2019, with over 100 people signed in on the official roster of attendees. The meeting consisted of a presentation (given by the MassDOT project manager) which was followed by a public comment period. The formal part of the meeting then ended and attendees were invited to join an “Open House” where people could talk with members of the project team. A detailed written summary of meeting is linked further below in this post. 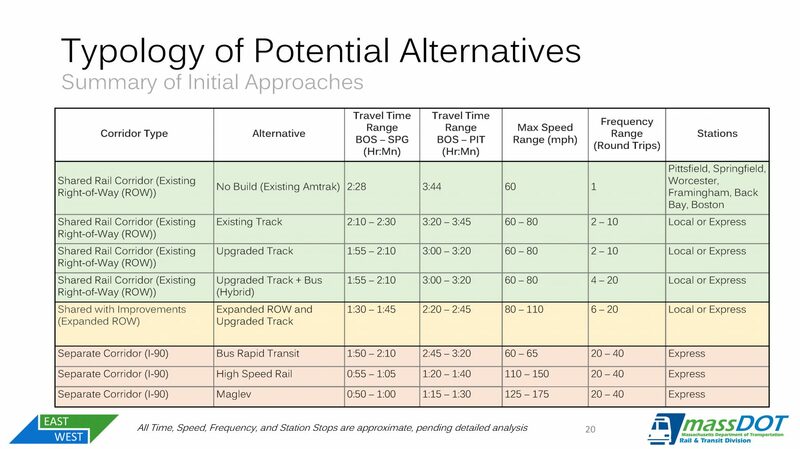 To the surprise of some, the official list of “potential approaches” now includes a Bus Rapid Transit option and a Maglev option. Maglev, which is derivative from the words magnetic levitation, is form of transportation that allows for high-speed ground travel at speeds in excess of 300 mph. It is safe to say that we will never see a Maglev line built in Massachusetts, for countless reasons, including the construction costs — which at the moment are in excess of $265 million per mile¹. The new Bus Rapid Transit option was quickly criticized for numerous reasons in a published Op-Ed piece [“Keep East-West Rail On Track” | The Republican] which argued that the study needs to stay focused on rail options. Next up for this study — The 2nd meeting of the East-West Rail Study Advisory Committee, later this spring. ¹ Based on the expected costs to build the Chuo Shinkansen maglev line in Japan. 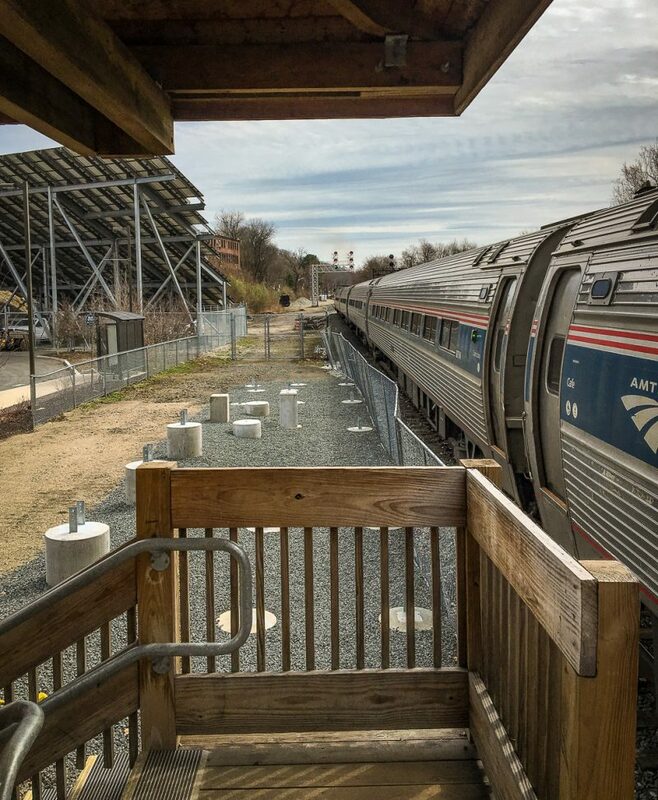 Rail service is on the rise in Western Mass. Hear from key leaders about train service from Springfield to Boston. Tim Brennan, Executive Director of the Pioneer Valley Planning Commission, speaking about more passenger rail from Springfield and some recent, climate-friendly developments in public transportation. Springfield Mayor Domenic Sarno will talk about his appointment to the Advisory Committee for MassDOT’s Study of East-West rail, and why expanded Springfield to Boston passenger rail which could be a boon for commuters, job hunters, and the economy. Reggie Wilson, Sixteen Acres Branch Library Manager, will present on environmentally friendly trains that could be used between Springfield and Boston. A woman was killed while attempting to cross the active rail line near Wason Avenue in Springfield’s North End on Monday, March 25, 2019. The person who died, who was said to be trespassing on the tracks, was hit by Amtrak train 56, the Vermonter, which was traveling north on the MassDOT-owned Connecticut River Main Line. Tragically this accident happened only weeks before the start of construction of a long-planned pedestrian tunnel under the tracks near the location of the accident. Our thoughts go out to the family of the deceased, the crew members on the train, and the first responders. The Rail Passengers Association held its annual meeting two weeks ago in Washington, D.C. This meeting brings together rail advocates from across the country for three days of meetings and presentations. The keynote speaker during lunch on Monday April 1st was Kenneth Hylander, the Executive Vice President and Chief Safety Officer for Amtrak. His presentation focused on the Safety Management System that Amtrak is putting n place across their organization. About half way through the presentation he got to the subject of railroad crossing safety. 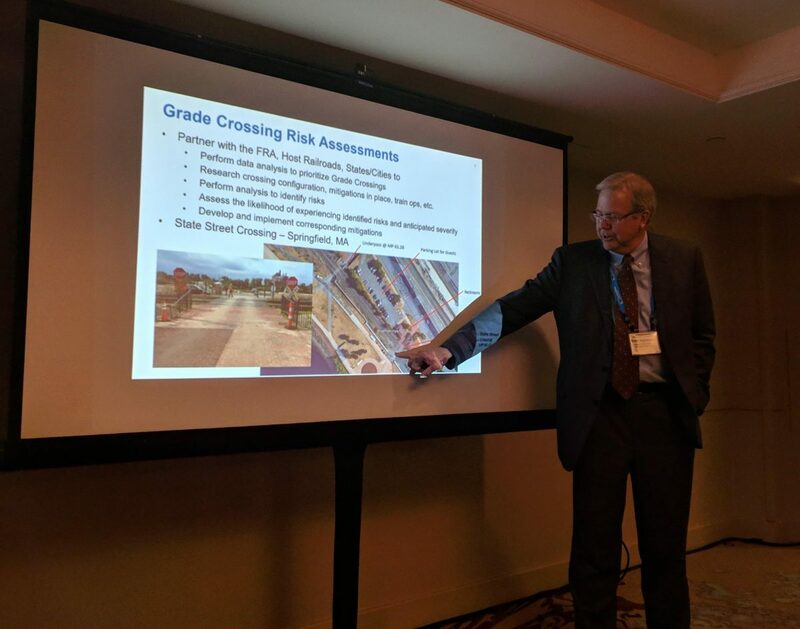 To the surprise of some in the room, the State Street crossing in Springfield was noted as the example of an extremely dangerous crossing on Amtrak’s network. In his remarks he said that Amtrak is actively working with the city of Springfield to find ways to make it possible for people to cross the Amtrak-owned tracks at this location using the underpass that is just to the north of the crossing rather than via the existing at-grade crossing at the end of State Street. How and why the State Street crossing became Amtrak’s poster-child for safer railroad crossings we do not know, but we are happy to see that Amtrak has finally started to pay attention to the dangerous situation that has existed at this crossing for many years. The Berkshire Regional Planning Commission and 1Berkshire has released their final report for the Berkshire Flyer 2.0 Project — A Pilot Seasonal Rail Service between New York City and The Berkshires. The new Berkshire Flyer service will operate use the existing tracks between Pittsfield and New York Penn Station via Albany/ Rensselaer and will function as an extension of Amtrak’s Empire Service. The two-year pilot service, which is scheduled to start in 2020, will run on a Friday northbound/ Sunday southbound schedule for twenty weeks of service annually between Memorial Day weekend and Columbus Day weekend. The estimated fare between New York Penn Station and Pittsfield, Mass. is projected to be $70 – $75 one-way. To advocate for improved and expanded passenger and freight rail service in the Pioneer Valley region of western Massachusetts.